Is the Chest Supported T-Bar Row Right for You? With a slight bend in the knees, find a comfortable position where the T-bar row machine's chest support pad is pressed against your entire sternum. Plant your feet about shoulder width apart on the foot platform. Depending on the particular piece of equipment and how your body fits on it, you may find it more comfortable to simply plant your feet on the floor instead of the platform. Reach down and grasp the handles in whichever position is most comfortable. Choose whichever grip position you prefer. 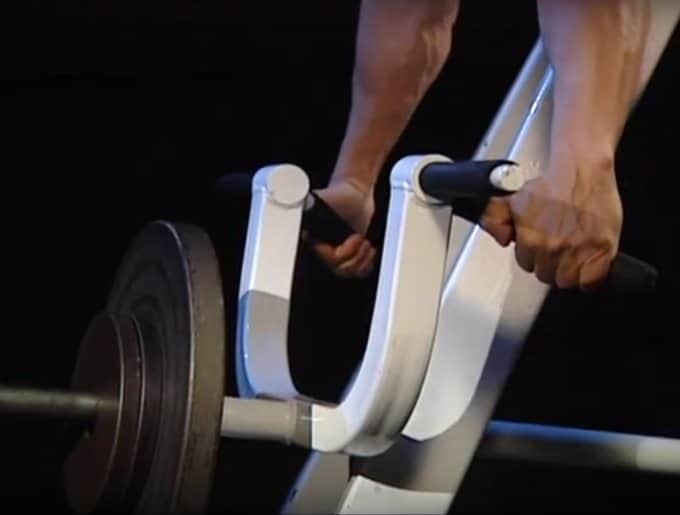 A wider grip width and/or straighter handles will hit the rear delts a bit more. Whereas, a closer grip width and/or angled handles will hit the lats a bit more. SIDE NOTE: The guy in this image is shown grasping the angled handles here, but in the rest of the photos (below) he's actually using the straight handles. The video where this image was taken from must have spliced two different clips together -- sorry for any confusion. Do not relax into the chest support pad. It's there for support, not to do all the work. You still need to maintain a rigid braced posture. Keep a bit of tension through your legs. This will prevent you from sliding down the pad while supporting your rigid neutral posture. Actively maintain a neutral cervical spine throughout the lift. Do not flex or extend your neck! From a slightly protracted shoulder blade position, initiate an “active shoulder” position by retracting the shoulder blades together, to bring them to their neutral position. You are now in the starting position and ready to begin the lift! Hoist the T-bar up off the pin on the side of the machine, and guide it to the center. Once you're holding it there in the center, motionless, with your arms straight and shoulder blades in a neutral position, you're in the starting position and ready to begin the lift. Pull the resistance with the goal of an upper arm position at about a 45 degree angle in relation to the trunk once you’ve hit the midpoint of the movement. Bring the bar as far up as you can until your shoulder blades are touching and your hands are in line with the bottom of your torso (this is the equivalent of touching the bar to your torso on barbell rows). If you can't do this, the load is too heavy and you need to take some weight off. Actively brace the core during the pull. Pull through your elbows and focus on using your back to do the lifting. Not just your arms. Remember: FULL range of motion. No half reps! Once the resistance has been pulled into the bench, utilize a hard isometric contraction to maximize voluntary muscular force. Maintain an active shoulder and an abdominal brace. Note the elbows are at about 45 degrees relative to the torso. Also, note the full range of motion and perfectly neutral neck posture at the peak of the motion. Try to aim for exactly this. Note how he brings his shoulder blades ALL the way together: fully retracted. This requires really focusing on, and activating, your rhomboids/mid-traps, in particular. Slowly return the resistance back to the starting position by straightening your elbows and allowing your shoulder blades to come forward somewhat. Decelerate as you reach lockout at the bottom. Slightly flare the elbows out to return the shoulder to neutral starting position. Don’t relax and let the weight fall back towards the ground. Keep it under control the whole time. Feel a nice stretch at the bottom. Again, don't relax. You don't want the weight hang on your shoulder joints. Keep the load under control as you lower it. Maintain a neutral posture (including your neck) just like the guy in this photo. This means bracing the core and keeping some tension in the legs. Just because you're laying on your belly, doesn't mean it's nap time! Extend your elbows fully and stretch at the bottom. Ease into the stretch; don't just drop the weight. Also, you don't want to stretch so much that your shoulders are at risk. Keep some tension and keep the shoulder joint in its socket. Allow your shoulder blades to glide down, around you rib cage as you embrace a mild to moderate stretch throughout your mid back musculature. Before you start the next rep, first allow the resistance to settle. Retract your shoulder blades from their protracted state, back into a neutral position. Complete as many reps as your routine calls for. I personally find the best results in the higher rep ranges (e.g. 12-20) on this exercise. But you can still get good results going as low as 5. 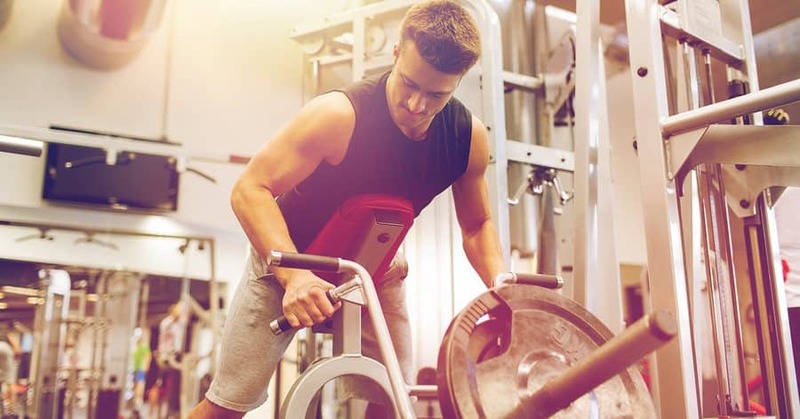 Understand though, for this lift in particular, it becomes increasingly harder to maintain good form as you increase the weight and lower the reps. The weight is most likely too heavy and should be reduced until a full ROM can be achieved. If the elbows are flaring too hard during the concentric movement (which is a viable variation for this lift), the majority of the work will be done by the traps, rhomboids, rear delts, and arms instead of the lats. Slightly tuck the elbows to maximally engage the lats. Each rep should be performed with the scapulas in a safe shoulder position. This means no more than slightly protracted at the bottom of the eccentric rep (the rest of the rep, it should be anywhere between neutral to fully retracted depending on which point you're at in the motion). This is especially important during the eccentric phase so that the shoulder does go “out” of the socket. Try to imagine “pulling the bar apart” during the entire lift. This will help reinforce active shoulder. Don’t try to use momentum generated from the trunk in order to get more ROM out of the exercise. Actively bracing the core and performing a slight anterior pelvic tilt will help reduce any extra trunk extension. Slightly tuck the elbows during the pull to maximally activate the lats. Actively brace the core and slightly tilt the hips forward. Pause slightly at the mid point to maximally activate the lats and mid-back musculature. Keep the shoulder blades retracted during the entire movement. Do not relax during the eccentric phase. Go wider and/or use the straight handles to emphasize the rear delts more. Go narrower and/or use the angled handles to emphasize the lats more. Avoid the former if you have any pre-existing shoulder joint or rotator cuff issues. The chest supported row is an excellent option for individuals who have a hard time maintaining a neutral posture during other row variations. With this movement, the majority of the postural support is taken over by the inherent position of the upper body on the bench. Because postural control is a little less of a concern with this row variation, this can be used to very effectively progressively overload the target back muscles, to achieve muscle and strength gains over a long period of time.